You might not think a Russian family name and a Dutch ichthyologist have anything in common, but you would be wrong. It seems the people in charge of naming REV’IT boots have a penchant for Eurasian history (actually, that’s just me). Enter the Bleeker boots. They’re a fresh take on a similar concept - marrying form and function with cool names which gives blog writers the opportunity to make jokes about foreign countries! Woo! Check out Bleeker. Seriously, that guy wore the best looking army uniform ever. None of his pictures show his feet, but I’m just about certain that he was wearing boots that looked exactly like these. While the REV'IT! Bleeker Boots have the same basic moto protection that you would expect from REV'IT!, but they are a bit more fashion oriented. They have the expected heel cup, toe box, firm sole, and ergonomic footbed, but in a package that is more elegant. 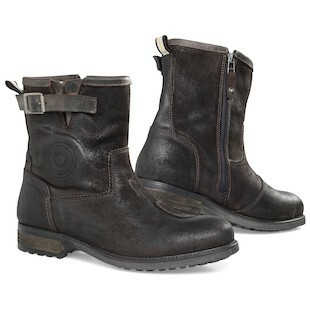 The Apache batido cowhide sure does sound exotic, which would explain these boots are so good-looking. They are slightly shorter than a typical Russian stomper, so while they won’t be quite as protective as those worn by the Siberian Guard, they will leave your shins free to explore the world. Some people enjoy looking like super heroes on their motorcycles. Some people enjoy looking like traffic cones. Some of you, however, enjoy looking like our normal selves (provided you’re already stylish). Luckily, REV’IT has made a pair of boots for you. Don’t expect to be carving canyons safely, but do expect to receiving envious glances at your local pub.